The Andalusian, also known as the Pure Spanish Horse or PRE (pura raza española), is a horse breed from the Iberian Peninsula, where its ancestors have lived for thousands of years. The Andalusian has been recognized as an distinct breed since the 15th century, and its conformation has changed very little over the centuries. Throughout its history, it has been known for its prowess as a war horse, and was prized by the nobility. The breed was used as a tool of diplomacy by the Spanish government, and kings across Europe rode and owned Spanish horses. During the 19th century, warfare, disease and crossbreeding reduced herd numbers dramatically, and despite some recovery in the late 19th century, the trend continued into the early 20th century. Exports of Andalusians from Spain were restricted until the 1960s, but the breed has since spread throughout the world, despite their low population. In 2010, there were more than 185,000 registered Andalusians worldwide. Strongly built, and compact yet elegant, Andalusians have long, thick manes and tails. Their most common coat color is gray, although they can be found in many other colors. They are known for their intelligence, sensitivity and docility. A sub-strain within the breed known as the Carthusian, is considered by breeders to be the purest strain of Andalusian, though there is no genetic evidence for this claim. The strain is still considered separate from the main breed however, and is preferred by breeders because buyers pay more for horses of Carthusian bloodlines. There are several competing registries keeping records of horses designated as Andalusian or PRE, but they differ on their definition of the Andalusian and PRE, the purity of various strains of the breed, and the legalities of stud book ownership. At least one lawsuit is in progress as of 2011[update], to determine the ownership of the Spanish PRE stud book. Andalusians stallions and geldings average 15.1 1⁄2 hands (61.5 inches, 156 cm) at the withers and 512 kilograms (1,129 lb) in weight; mares average 15 1⁄2 hands (60.5 inches, 154 cm) and 412 kilograms (908 lb). The Spanish government has set the minimum height for registration in Spain at 15.0 hands (60 inches, 152 cm) for males and 14.3 hands (59 inches, 150 cm) for mares — this standard is followed by the Association of Purebred Spanish Horse Breeders of Spain (Asociación Nacional de Criadores de Caballo de Pura Raza Española or ANCCE) and the Andalusian Horse Association of Australasia. The Spanish legislation also requires that in order for animals to be approved as either "qualified" or "élite" breeding stock, stallions must stand at least 15.1 hands (61 inches, 155 cm) and mares at least 15 1⁄4 hands (60.25 inches, 153 cm). There are two additional characteristics unique to the Carthusian strain, believed to trace back to the strain's foundation stallion Esclavo. The first is warts under the tail, a trait which Esclavo passed to his offspring, and a trait which some breeders felt was necessary to prove that a horse was a member of the Esclavo bloodline. The second characteristic is the occasional presence of "horns", which are frontal bosses, possibly inherited from Asian ancestors. The physical descriptions of the bosses vary, ranging from calcium-like deposits at the temple to small horn-like protuberances near or behind the ear. However, these "horns" are not considered proof of Esclavo descent, unlike the tail warts. The movement of Andalusian horses is extended, elevated, cadenced and harmonious, with a balance of roundness and forward movement. Poor elevation, irregular tempo, and excessive winging (sideways movement of the legs from the knee down) are discouraged by breed registry standards. Andalusians are known for their agility and their ability to learn difficult moves quickly, such as advanced collection and turns on the haunches. A 2001 study compared the kinematic characteristics of Andalusian, Arabian and Anglo-Arabian horses while moving at the trot. Andalusians were found to overtrack less (the degree to which the hind foot lands ahead of the front hoof print) but also exhibit greater flexing of both fore and hind joints, movement consistent with the more elevated way of going typically found in this breed. The authors of the study theorized that these characteristics of the breed's trot may contribute to their success as a riding and dressage horse. ... the noblest horse in the world, the most beautiful that can be. He is of great spirit and of great courage and docile; hath the proudest trot and the best action in his trot, the loftiest gallop, and is the lovingest and gentlest horse, and fittest of all for a king in his day of triumph. The Andalusian horse is descended from the Iberian horses of Spain and Portugal, and derives its name from its place of origin, the Spanish region of Andalusia. Cave paintings show that horses have been present on the Iberian Peninsula as far back as 20,000 to 30,000 BCE. Although Portuguese historian Ruy d'Andrade hypothesized that the ancient Sorraia breed was an ancestor of the Southern Iberian breeds, including the Andalusian, genetic studies using mitochondrial DNA show that the Sorraia is part of a genetic cluster that is largely separated from most Iberian breeds. Throughout history, the Iberian breeds have been influenced by many different peoples and cultures who occupied Spain, including the Celts, the Carthaginians, the Romans, various Germanic tribes and the Moors. The Iberian horse was identified as a talented war horse as early as 450 BCE. Mitochondrial DNA studies of the modern Andalusian horse of the Iberian peninsula and Barb horse of North Africa present convincing evidence that both breeds crossed the Strait of Gibraltar and were used for breeding with each other, influencing one another's bloodlines. Thus, the Andalusian may have been the first European "warmblood", a mixture of heavy European and lighter Oriental horses. Some of the earliest written pedigrees in recorded European history were kept by Carthusian monks, beginning in the 13th century. Because they could read and write, and were thus able to maintain careful records, monastics were given the responsibility for horse breeding by certain members of the nobility, particularly in Spain. Andalusian stud farms for breeding were formed in the late 15th century in Carthusian monasteries in Jerez, Seville and Cazalla. The Carthusians bred powerful, weight-bearing horses in Andalusia for the Crown of Castile, using the finest Spanish Jennets as foundation bloodstock. These horses were a blend of Jennet and warmblood breeding, taller and more powerfully built than the original Jennet. By the 15th century, the Andalusian had become a distinct breed, and was being used to influence the development of other breeds. They were also noted for their use as cavalry horses. 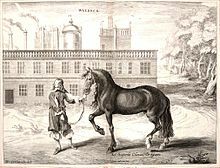 Even though in the 16th and 17th centuries Spanish horses had not reached the final form of the modern Andalusian, by 1667 William Cavendish, the Duke of Newcastle, called the Spanish horse of Andalusia the "princes" of the horse world, and reported that they were "unnervingly intelligent". The Iberian horse became known as the "royal horse of Europe" and was seen at many royal courts and riding academies, including those in Austria, Italy, France and Germany. By the 16th century, during the reigns of Charles V (1500–1558) and Phillip II (1556–1581), Spanish horses were considered the finest in the world. Even in Spain, quality horses were owned mainly by the wealthy. During the 16th century, inflation and an increased demand for harness and cavalry horses drove the price of horses extremely high. The always expensive Andalusian became even more so, and it was often impossible to find a member of the breed to purchase at any price. A 1743 engraving of a "Spanish horse"
Spanish horses also were spread widely as a tool of diplomacy by the government of Spain, which granted both horses and export rights to favored citizens and to other royalty. As early as the 15th century, the Spanish horse was widely distributed throughout the Mediterranean, and was known in northern European countries, despite being less common and more expensive there. As time went on, kings from across Europe, including every French monarch from Francis I to Louis XVI, had equestrian portraits created showing themselves riding Spanish-type horses. The kings of France, including Louis XIII and Louis XIV, especially preferred the Spanish horse; the head groom to Henri IV, Salomon de la Broue, said in 1600, "Comparing the best horses, I give the Spanish horse first place for its perfection, because it is the most beautiful, noble, graceful and courageous". War horses from Spain and Portugal began to be introduced to England in the 12th century, and importation continued through the 15th century. In the 16th century, Henry VIII received gifts of Spanish horses from Charles V, Ferdinand II of Aragon and the Duke of Savoy and others when he wed Katherine of Aragon. He also purchased additional war and riding horses through agents in Spain. By 1576, Spanish horses made up one third of British royal studs at Malmesbury and Tutbury. The Spanish horse peaked in popularity in Great Britain during the 17th century, when horses were freely imported from Spain and exchanged as gifts between royal families. With the introduction of the Thoroughbred, interest in the Spanish horse faded after the mid-18th century, although they remained popular through the early 19th century. The Conquistadors of the 16th century rode Spanish horses, particularly animals from Andalusia, and the modern Andalusian descended from similar bloodstock. By 1500, Spanish horses were established in studs on Santo Domingo, and Spanish horses made their way into the ancestry of many breeds founded in North and South America. Many Spanish explorers from the 16th century on brought Spanish horses with them for use as war horses and later as breeding stock. By 1642, the Spanish horse had spread to Moldovia, to the stables of Transylvanian prince George Rakoczi. Despite their ancient history, all living Andalusians trace to a small number of horses bred by religious orders in the 18th and 19th centuries. An influx of heavy horse blood beginning in the 16th century, resulted in the dilution of many of the bloodlines; only those protected by selective breeding remained intact to become the modern Andalusian. During the 19th century, the Andalusian breed was threatened because many horses were stolen or requisitioned in wartime, including the War of the Oranges, the Peninsular War and the three Carlist Wars. Napoleon's invading army also stole many horses. One herd of Andalusians was hidden from the invaders however, and subsequently used to renew the breed. In 1822, breeders began to add Norman blood into Spanish bloodlines, as well as further infusions of Arabian blood. This was partially because increasing mechanization and changing needs within the military called for horses with more speed in cavalry charges as well as horses with more bulk for pulling gun carriages. In 1832, an epidemic seriously affected Spain's horse population, from which only one small herd survived in a stud at the monastery in Cartuja. During the 19th and early 20th centuries, European breeders, especially the Germans, changed from an emphasis on Andalusian and Neapolitan horses (an emphasis that had been in place since the decline of chivalry), to an emphasis on the breeding of Thoroughbreds and warmbloods, further depleting the stock of Andalusians. Despite this change in focus, Andalusian breeding slowly recovered, and in 1869, the Seville Horse Fair (originally begun by the Romans), played host to between ten and twelve thousand Spanish horses. In the early 20th century, Spanish horse breeding began to focus on other breeds, particularly draft breeds, Arabians, Thoroughbreds and crosses between these breeds, as well as crosses between these breeds and the Andalusian. 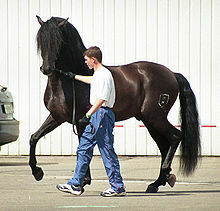 The purebred Andalusian was not viewed favorably by breeders or the military, and their numbers decreased significantly. The Carthusian Andalusian or Cartujano is generally considered the purest Andalusian strain, and has one of the oldest recorded pedigree lines in the world. The pure sub-type is rare, as only around 12 percent of the Andalusian horses registered between the founding of the stud book in the 19th century and 1998 were considered Carthusians. They made up only 3.6 percent of the overall breeding stock, but 14.2 percent of the stallions used for breeding. In the past, Carthusians were given preference in breeding, leading to a large proportion of the Andalusian population claiming ancestry from a small number of horses and possibly limiting the breed's genetic variability. A 2005 study compared the genetic distance between Carthusian and non-Carthusian horses. They calculated a Fixation index (FST) based on genealogical information and concluded that the distinction between the two is not supported by genetic evidence. However, there are slight physical differences; Carthusians have more "oriental" or concave head shapes and are more often gray in color, while non-Carthusians tend toward convex profiles and more often exhibit other coat colors such as bay. The Carthusian line was established in the early 18th century when two Spanish brothers, Andrés and Diego Zamora, purchased a stallion named El Soldado and bred him to two mares. The mares were descended from mares purchased by the Spanish king and placed at Aranjuez, one of the oldest horse breeding farms in Spain. One of the offspring of El Soldado, a dark gray colt named Esclavo, became the foundation sire of the Carthusian line. One group of mares sired by Esclavo in about 1736 were given to a group of Carthusian monks to settle a debt. Other animals of these bloodlines were absorbed into the main Andalusian breed; the stock given to the monks was bred into a special line, known as Zamoranos. Throughout the following centuries, the Zamoranos bloodlines were guarded by the Carthusian monks, to the point of defying royal orders to introduce outside blood from the Neapolitan horse and central European breeds. They did, however, introduce Arabian and Barb blood to improve the strain. The original stock of Carthusians was greatly depleted during the Peninsular Wars, and the strain might have become extinct if not for the efforts of the Zapata family. Today, the Carthusian strain is raised in state-owned stud farms around Jerez de la Frontera, Badajoz and Cordoba, and also by several private families. Carthusian horses continue to be in demand in Spain, and buyers pay high prices for members of the strain. Spain's worldwide military activities between the 14th and 17th centuries called for large numbers of horses, more than could be supplied by native Spanish mares. Spanish custom also called for mounted troops to ride stallions, never mares or geldings. Due to these factors, Spanish stallions were crossed with local mares in many countries, adding Spanish bloodlines wherever they went, especially to other European breeds. Because of the influence of the later Habsburg families, who ruled in both Spain and other nations of Europe, the Andalusian was crossbred with horses of Central Europe and the Low Countries and thus was closely related to many breeds that developed, including the Neapolitan horse, Groningen, Lipizzaner and Kladruber. Spanish horses have been used extensively in classical dressage in Germany since the 16th century. They thus influenced many German breeds, including the Hanoverian, Holstein, East Friesian and Oldenburg. Dutch breeds such as the Friesian and Gelderland also contain significant Spanish blood, as do Danish breeds such as the Frederiksborg and Knabstrupper. Until modern times, horse breeds throughout Europe were known primarily by the name of the region where they were bred. Thus the original term "Andalusian" simply described the horses of distinct quality that came from Andalusia in Spain. Similarly, the Lusitano, a Portuguese horse very similar to the Andalusian, takes its name from Lusitania, an ancient Roman name for Portugal. The Andalusian horse has been known historically as the Iberian Saddle Horse, Iberian War Horse, Spanish Horse, Portuguese, Peninsular, Extremeño, Villanos, Zapata, Zamoranos, Castilian, and Jennet. The Portuguese name refers to what is now the Lusitano, while the Peninsular, Iberian Saddle Horse and Iberian War Horse names refer to horses from the Iberian Peninsula as a whole. The Extremeño name refers to Spanish horses from the Extremadura province of Spain and the Zapata or Zapatero name to horses that come from the Zapata family stud. The Villano name has occasionally been applied to modern Andalusians, but originally referred to heavy, crossbred horses from the mountains north of Jaen. The Carthusian horse, also known as the Carthusian-Andalusian and the Cartujano, is a sub-type of the Andalusian, rather than a distinct breed in itself. A common nickname for the Andalusian is the "Horse of Kings". Some sources state that the Andalusian and the Lusitano are genetically the same, differing only in the country of origin of individual horses. In many areas today, the breeding, showing, and registration of the Andalusian and Lusitano are controlled by the same registries. One example of this is the International Andalusian and Lusitano Horse Association (IALHA), claimed to have the largest membership of any Andalusian registering organization. Other organizations, such as The Association of Purebred Spanish Horse Breeders of Spain (Asociación Nacional de Criadores de Caballo de Pura Raza Española or ANCCE), use the term pura raza española or PRE to describe the true Spanish horse, and claim sole authority to officially register and issue documentation for PRE Horses, both in Spain and anywhere else in the world. In most of the world the terms "Andalusian" and "PRE" are considered one and the same breed, but the public position of the ANCCE is that terms such as "Andalusian" and "Iberian horse" refer only to crossbreds, which the ANCCE considers to be horses that lack quality and purity, without official documentation or registration from official Spanish Stud Book. In Australasia, the Australasia Andalusian Association registers Andalusians (which the registry considers an interchangeable term for PRE), Australian Andalusians, and partbred Andalusians. They share responsibility for the Purebred Iberian Horse (an Andalusian/Lusitano cross) with the Lusitano Association of Australasia. In the Australian registry, there are various levels of crossbred horses. A first cross Andalusian is a crossbreed that is 50 percent Andalusian, while a second cross Andalusian is the result of crossing a purebred Andalusian with a first cross – resulting in a horse of 75 percent Andalusian blood. A third cross, also known by the registry as an Australian Andalusian, is when a second cross individual is mated with a foundation Andalusian mare. This sequence is known as a "breeding up" program by the registry. The name pura raza española (PRE), usually rendered in English "Pure Spanish Horse" (not a literal translation) is the term used by the ANCCE, a private organization, and the Ministry of Agriculture of Spain. The ANCCE uses neither the term "Andalusian" nor "Iberian horse", and only registers horses that have certain recognized bloodlines. In addition, all breeding stock must undergo an evaluation process. The ANCCE was founded in 1972. Spain's Ministry of Agriculture recognizes the ANCCE as the representing entity for PRE breeders and owners across the globe, as well as the administrator of the breed stud book. ANCCE functions as the international parent association for all breeders worldwide who record their horses as PRE. For example, the United States PRE association is affiliated with ANCCE, follows ANCCE rules, and has a wholly separate governance system from the IALHA. As of August 2011[update], there is a lawsuit in progress to determine the legal holder of the PRE stud book. The Unión de Criadores de Caballos Españoles (UCCE or Union of Spanish Horse Breeders) has brought a case to the highest European Union courts in Brussels, charging that the Ministry of Spain's transfer of the original PRE Libro de Origen (the official stud book) from the Cria Caballar to ANCCE was illegal. In early 2009, the courts decided on behalf of UCCE, explaining that the Cria Caballar formed the Libro de Origin. Because it was formed by a government entity, it is against European Union law for the stud book to be transferred to a private entity, a law that was broken by the transfer of the book to ANCCE, which is a non-governmental organization. The court found that by giving ANCCE sole control of the stud book, Spain's Ministry of Defense was acting in a discriminatory manner. The court held that Spain must give permission to maintain a breed stud book (called a Libro Genealógico) to any international association or Spanish national association which requests it. Based on the Brussels court decision, an application has been made by the Foundation for the Pure Spanish Horse to maintain the United States stud book for the PRE. As of March 2011[update], Spain has not revoked ANCCE's right to be the sole holder of the PRE stud book, and has instead reaffirmed the organization's status. The Andalusian breed has over the centuries been consistently selected for athleticism. In the 17th century, referring to multi-kilometer races, Cavendish said, "They were so much faster than all other horses known at that time that none was ever seen to come close to them, even in the many remarkable races that were run." In 1831, horses at five years old were expected to be able to gallop, without changing pace, four or five leagues, about 12 to 15 miles (19 to 24 km). By 1925, the Portuguese military expected horses to "cover 40 km over uneven terrain at a minimum speed of 10 km/h, and to gallop a flat course of 8 km at a minimum speed of 800 metres per minute carrying a weight of at least 70 kg", and the Spanish military had similar standards. ^ a b The Spanish pura raza española literally translates to 'Spanish pure breed'. This Spanish name is sometimes capitalized when used in English-language publications, but is all lower-case in Spanish, which does not capitalize adjectives derived from proper nouns. ^ "The Purebred Spanish Horse". Andalusian Horse Association of Australasia. Archived from the original on 2012-01-25. Retrieved 2011-12-14. ^ a b c d e f g h i j "Andalusian". International Museum of the Horse. Retrieved 2012-04-01. ^ a b "Chapter AL: Andalusian/Lusitano Division". United States Equestrian Federation. p. AL7. Retrieved 2009-06-26. ^ a b c d e f "Andalusian". Breeds of Livestock. Oklahoma State University. Archived from the original on 2009-04-10. Retrieved 2012-06-21. ^ a b c d e f "Carthusian". Breeds of Livestock. Oklahoma State University. Archived from the original on 2010-12-29. Retrieved 2008-12-06. ^ "Andalusian/Lusitano Characteristics". United States Equestrian Federation. Retrieved 2009-06-26. ^ "Rules and regulations of registration". International Andalusian and Lusitano Horse Association. Archived from the original on 2008-06-08. Retrieved 2010-05-22. ^ a b c "Important Information About the PRE Horse". National Association of Purebred Horse Breeders of Spain. Archived from the original on 2012-04-21. Retrieved 2012-02-17. ^ Cano, M.R. ; Vivo, J.; Miro, F.; Morales, J.L. ; Galisteo, A.M. (2001). "Kinematic characteristics of Andalusian, Arabian and Anglo-Arabian horses: a comparative study". Research in Veterinary Science. 71 (2): 147–153. doi:10.1053/rvsc.2001.0504. PMID 11883894. ^ Muñoz, E.; Argüelles, D.; Areste, L.; San Miguel, L.; Prades, M. (2008). "Retrospective analysis of exploratory laparotomies in 192 Andalusian horses and 276 horses of other breeds". Veterinary Record. 162 (10): 303–306. doi:10.1136/vr.162.10.303. ^ d'Andrade, R (1945). "Sorraia". Boletim Pecuário (in Portuguese). 13: 1–13. ^ Cai, Dawei; Tang, Zhuowei; Han, Lu; Speller, Camilla F.; Yang, Dongya Y.; Ma, Xiaolin; Cao, Jian'en; Zhu, Hong; Zhou, Hui (2009). "Ancient DNA provides new insights into the origin of the Chinese domestic horse" (PDF). Journal of Archaeological Science. 36 (3): 835–842. doi:10.1016/j.jas.2008.11.006. Retrieved 2011-01-17. ^ McGahern, A; Bower, M. A. M.; Edwards, C. J.; Brophy, P. O.; Sulimova, G.; Zakharov, I.; Vizuete-Forster, M.; Levine, M.; Li, S.; MacHugh, D. E.; Hill, E. W. (2006). "Evidence for biogeographic patterning of mitochondrial DNA sequences in Eastern horse populations". Animal Genetics. 37 (5): 494–497. doi:10.1111/j.1365-2052.2006.01495.x. PMID 16978180. ^ Bennett, Deb (2008). "The Spanish Mustang: The Origin and Relationships of the Mustang, Barb, and Arabian Horse" (PDF). Equine Studies Institute. Retrieved 2010-04-12. ^ "Association History". Andalusian Horse Association of Australasia. Archived from the original on 2009-03-27. Retrieved 2009-06-20. ^ "About Andalusians". United States Equestrian Federation. Archived from the original on 2011-10-19. Retrieved 2011-12-09. ^ a b Molina, A.; Valera, M.; Galisteo, A.M.; Vivo, J.; Gomez, M.D. ; Rodero, A.; Aguera, E. (2008). "Genetic parameters of biokinematic variables at walk in the Spanish Purebred (Andalusian) horse using experimental treadmill records". Livestock Science. 116 (116): 137–145. doi:10.1016/j.livsci.2007.09.021. ^ "Raza equino caballar pura raza española: Datos censales" (in Spanish). Ministerio de Medio Ambiente, y Medio Rural y Marino. Retrieved 2011-12-13. ^ "Breed Information". American Azteca International Horse Association. Archived from the original on 2011-05-20. Retrieved 2012-02-17. ^ "The Foundation". International Warlander Society & Registry. Retrieved 2011-12-09. ^ "Spanish-Norman". International Museum of the Horse. Archived from the original on 2012-04-15. Retrieved 2012-04-01. ^ Price, Barbara (October 22, 2008). "Iberian Horses Wow Crowds at IALHA National Championship Show in Fort Worth". United States Equestrian Federation. Retrieved 2009-06-26. ^ Stephens, Stephanie (July–August 2005). "Dressage:Superlative Alternatives" (PDF). Equestrian: 65–66. Archived from the original (PDF) on 2011-06-17. Retrieved 2009-06-26. ^ "Homepage". Andalusian Horse Association of Australasia. Retrieved 2009-06-20. ^ "The AHAA Stud Book for the Pure Spanish Horse". Andalusian Association of Australasia. Archived from the original on 14 October 2009. Retrieved 2009-10-25. ^ "About". United States PRE Association. Retrieved 2009-06-27. ^ "P.R.E. Mundial Defined". Foundation for the Pure Spanish Horse. Archived from the original on 2015-01-09. Retrieved 2012-03-29. ^ "UCCE Press Release" (PDF). The Foundation for the Pure Spanish Horse. August 1, 2011. Archived from the original (PDF) on January 9, 2015. Retrieved 2012-04-01. ^ "Brussels Court Declares Certain Actions Illegal". Ecuestre. May 2009. ^ "Spain Denounces PRE Mundial". United States PRE Association. March 14, 2011. Archived from the original on August 20, 2011. Retrieved 2011-09-29. ^ a b Veder, Tina (September 2005). "The Andalusian & Lusitano" (PDF). Equestrian: 53. Archived from the original (PDF) on 2011-06-17. Retrieved 2009-06-26. ^ "USC Mascot Traveler". Asman & Associates. Retrieved 2011-12-09. ^ "Traveler". University of Southern California. Archived from the original on 26 May 2009. Retrieved 2009-06-18. ^ "PRE Trivia". The Foundation for the Pure Spanish Horse. Archived from the original on 2009-02-07. Retrieved 2009-06-15. ^ "Eagle Bronze Foundry in Lander, WY, personnel assembled the largest bronze horse in the world". Foundry Management & Technology. 134 (6): 6. June 2006. Bennett, Deb (1998). Conquerors: The Roots of New World Horsemanship. Solvang, CA: Amigo Publications. ISBN 978-0-9658533-0-9. Bongianni, Maurizio, ed. (1988). Simon & Schuster's Guide to Horses and Ponies. New York: Simon & Schuster, Inc. ISBN 978-0-671-66068-0. Loch, Sylvia (1986). The Royal Horse of Europe: The Story of the Andalusian and Lusitano. London: J. A. Allen. ISBN 978-0-85131-422-8. Raber, Karen (2005). "A Horse of a Different Color: Nation and Race in Early Modern Horsemanship Treatises". In Raber, Karen; Tucker, Treva J. The Culture of the Horse: Status, Discipline, and Identity in the Early Modern World. New York: Palgrave MacMillan. ISBN 978-1-4039-6621-6. Walker, Stella A; Summerhays, R. S. (1975). Summerhays' Encyclopaedia for Horsemen. London: F. Warne. ISBN 978-0-7232-1763-3.